With all the blogging I have been doing about concerts and various other subjects I thought perhaps now would be a good time to talk out a friend, and musician who has certainly changed my life. That is Tim Horner. drummer, composer, educator, violist, a spiritual motivator, a gentle loving person, and one of my best friends. Maybe 20 plus years ago I met Tim while I was sitting in on a Joe Locke gig that Tim was playing. Joe invited me up to play a tune at the old Village Gate on Bleecker Street in New York City. I had heard Tim play a few times, but never had played with him. The next time I played with Tim was in 2002, when I started a new band after maybe a five-year lapse in my recording career. I had met Allen Farnham the great jazz pianist, and educator on a Liza Minelli tour, and we decided to get together when we returned to New York to run through some new compositions I had recently written. From that get together I formed a band for the recording “The Motive Series” with the late Michael Brecker as a guest artist. I called Tim, and asked him if he’d like to do it with Allen Farnham, Phil Palombi, and myself. Tim agreed, and that began a relationship that has truly altered my life in a really positive way. The record did well, and I was grateful of course to have Michael Brecker on it as he just burned up the two tunes he played on. Since then with a change in the bass slot to Dean Johnson, the band has made four memorable recordings, and been on five European tours as well as recorded a live DVD. These recordings have launched my solo career to place it has never been. I have been able to really get my name out there better than ever before. I owe it all to that band, but Tim and I have now gone off to co lead a band that is currently on a Russia/Asia tour for 4 weeks. It is the longest tour we have ever done together. Tim and I have become one on the stage. 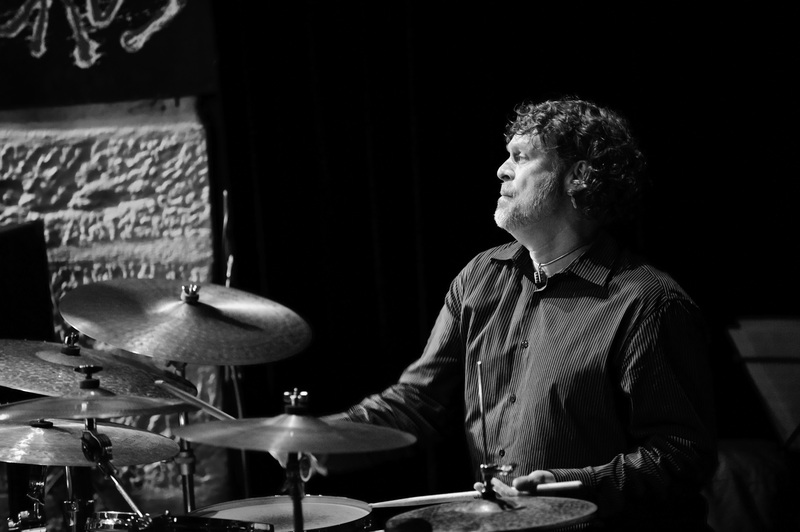 I play to my highest level with him as he encapsulates the essence of what jazz drumming has evolved to today. He has a true knowledge of music in every way. As a fine violist, Tim understands melody, and harmony quite well. Better than any drummer I have ever come across, and I have played with many of the finest in the world. He is ever supportive of the music, and lives the music with each and every note he plays. His groove is super deep, and his technique allows him to capture the feeling of all the greatest jazz drummers who ever lived. Players like Max Roach, Philly Joe Jones, Elvin Jones, Roy Haynes, Tony Williams, and Jack Dejohnette. Tim sounds like all of them, and most of all like himself. Some nights I look over to him in the midst of a performance, and I realize I am playing with one of the world’s greatest musicians. 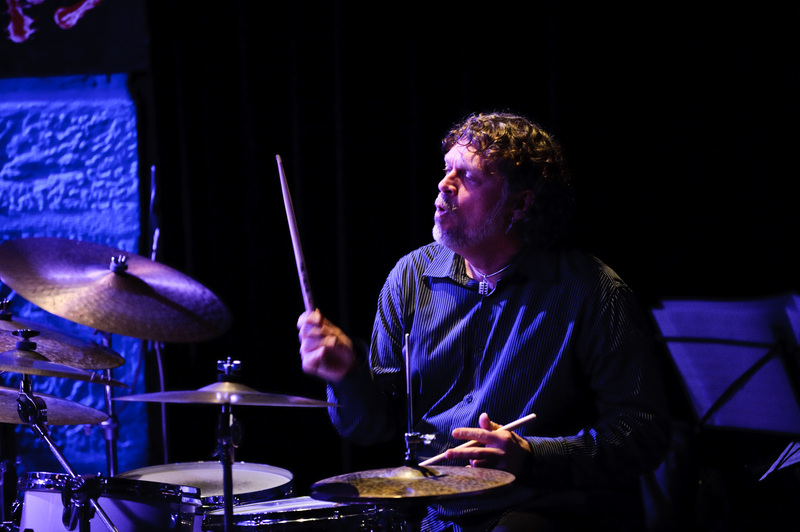 All the master drummers I have just mentioned cannot be mentioned without including Tim Horner. Actually he has something over all of them. He is a fine composer. He has written several songs for this tour that have really proved this to me. His tune “Museum Piece”, that he wrote while looking at a painting in a New York museum for three hours one day, captures everything music is about for me. A gorgeous melody, with deep harmony, and a deeply rooted concept. With an opening statement of the melody with just solo piano with the pedal down, begins this composition setting a mood, which is truly mesmerizing for me as a player. Every night I close my eyes as if in a chant, and reach deep in my heart for a heart wrenching performance of this piece. Then I state the melody as the rhythm section follows me into the highest level of spirituality in music I have ever reached. Then trading complete choruses nightly with Jim Ridl on piano raises my spirit every performance. We step the ladder with each chorus increasing in intensity as Tim builds and builds the feeling underneath us as we reach for uncharted territory nightly. This piece is simply why I live to play this music. I see god every time we perform it. Tim and I have stuck together with the music for 7-8 years now, and it has changed my life for the better. Of course with all this closeness in the music Tim Horner and I have become the closest of friends, and colleagues. The world should know Tim Horner is one of the finest all around musicians in the world. Bravo Tim, and thanks for the music. I will love you forever for the positive effect you have had on my life! The 4tet did a nice mini concert (3-4 tunes) and a master class at the philharmonic hall in Vladivostok Russia yesterday. There were 80-100 eager music students and enthusiasts there to watch us along with 2 or 3 TV cameras filming it for the news as on Sunday night we have a big concert in the same hall that will surely be packed. Everything went well as we opened up by playing 3 tunes. One of mine entitled “Little Lullaby”, which started as a slow sensitive waltz that I composed when my little girl Ella was an infant and we routinely rocked her in her rocking chair. This piece over the last 7 years with the 4tet has evolved into a hard driving waltz that is surely not a lullaby anymore, but a nice vehicle for our art form of improvisation. Then we played a beautiful ballad by Tim Horner who always has had my ultimate respect as a musician, drummer, and violist, but until this past 6 months I had know idea that he was a great writer as well. This ballad is an absolutely beautiful piece entitled “The Museum Piece” that he wrote while sitting staring at art at the museum in New York City with his wife Nitza, a fantastically talented sculptor and artist from Israel. Anyone who cannot get motivated by this piece is DEAD! It captures what I personally live for in the music. The use of beautiful melody, chords and a free approach to rhythm and form that reminds me why I play this music. It is a very emotional piece that has really gotten under my skin. Can’t wait to play it tonight at our concert in Nakhodka Russia. 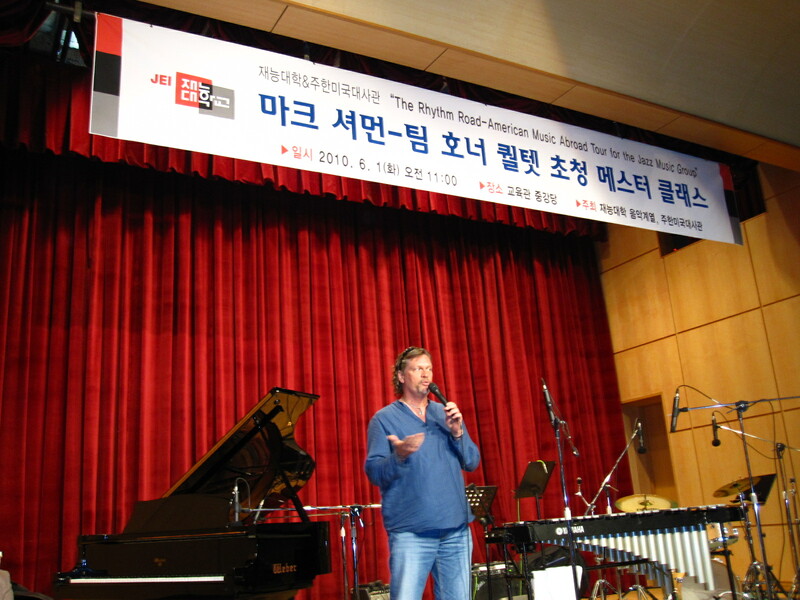 After that we played one of Jim Ridl’s compositions entitled “Smile Said The Drum” which is dedicated to Elvin Jones one of my teachers and heroes in the music. The title refers to Elvin’s infectious smile that was on his face all the time. Jim Ridl is absolutely one of the finest writers I have worked with in my life, and it is a total privilege to address all the music he has brought forth in this 4tet. 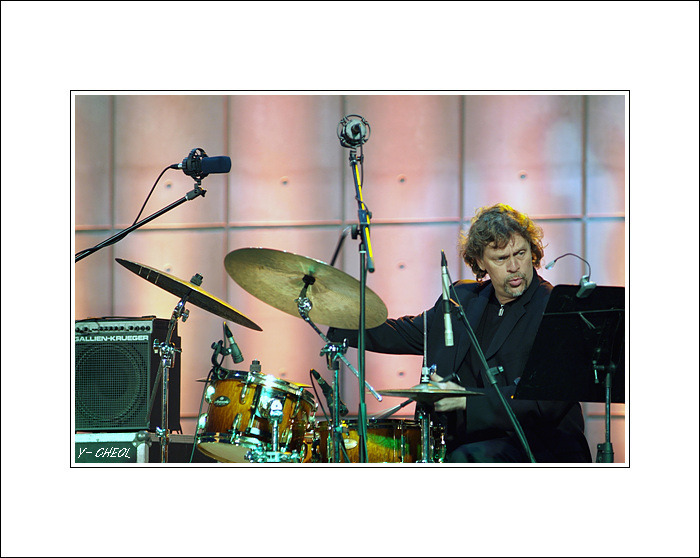 His music has emotion, direction, deep harmony, and is flat out challenging and fun to play. Our bassist Tom Dicarlo is the youngest in the group, but addresses the music like a seasoned veteran. His sound is warm, and his intonation is note perfect. He locks up with Tim Horner underneath Jim Ridl, and myself to create the magic, and rhythmic current that flows through the music direct into my heart. After the 3 opening tunes we opened up for questions with a translator of course. After many questions about the technical aspects of the vibraphone, someone asked if I ever play solo on the vibes. So I knocked out a quick solo version of “Stella By Starlight”. More questions continued and then we spoke about the musical handouts we prepared, and of course they were given out to each person who attended. Lots of handshakes, and autographs were signed, and some CD’s given out as well. All in all a great musical start to this month long tour. In our briefing with Jazz At Lincoln Center, and The US State Department prior to our departure they told us “get ready to be treated like rock stars”. Well they were correct. That is exactly how we have been treated. It was all filmed by a TV crew and was on the news several times last night and this morning. We are all having a blast! Today a 3-hour drive to Nakhodka, and a concert tonight. Can’t wait to play again. This band is on fire already, and we just began the tour! 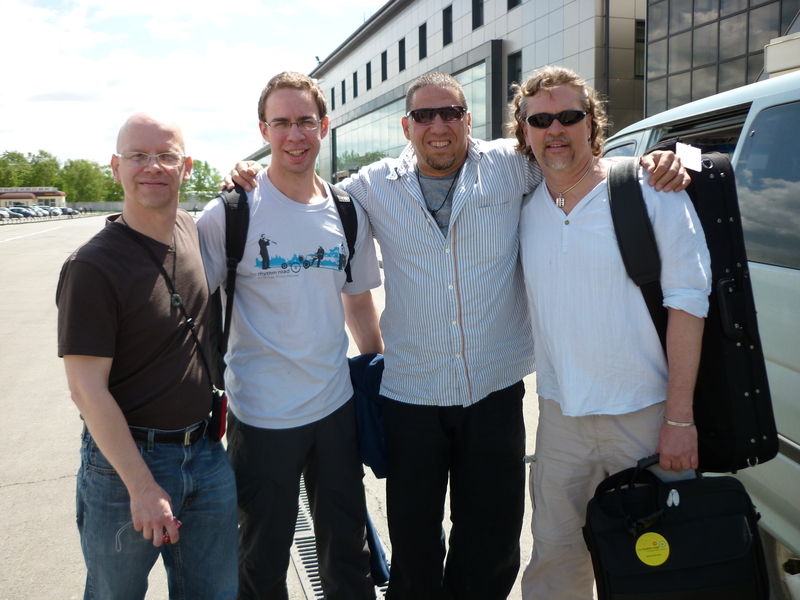 The Mark Sherman/Tim Horner 4tet began the Rhythm Road/US State Department tour with a flight from NYC to Seoul Korea. The flight was uneventful. I personally have flown to Japan, and other flights that are 14-15 hours, and after all these years it is still just as uncomfortable as it always was. It takes such a tremendous toll on your body. My sinuses were so messed up after the flight from the pressure of being 40,000 feet in the air for 15 hours. The whole thing really messes your system up. Anyway we arrived safely in Seoul, and checked into the Airport Transit hotel, which is generally used for people who are changing planes and have an overnight wait as we did. The rooms were small but adequate. The only drag was there were no windows in the hotel as it is actually one flight above the airport itself. The next morning as we were walking to our gate for our flight to Russia, I turned to Tim Horner and said, ” Man we have not seen daylight or had a breath of fresh air in 24 hours. I really noticed this, and missed the air. The hotel had air conditioning of course, and prior to that we had been flying the long flight, so I really noticed that I had not taken in any fresh air in a long time. That air conditioning and airplane air just dries you out and creates a lot of stress on your body. Anyway we caught our flight to Vladivostok, Russia, and arrived safely. A few interesting things happened upon arrival. As we exited the plane a mean looking security officer pointed a laser beam at everyone entering Russia as we passed the flight cockpit. I found out that this was a method they use to detect if anyone is running a fever. This is their way of preventing H1N1 from spreading into Russia. Very interesting as I never experienced that form of security. Next the entire plane piled into a bus that would take us to the terminal. Well they piled us in like sardines and eventually the doors closed. We literally drove 10 feet to an entrance to the terminal. We all looked at each other in disbelief as we all simply could have walked the 10 feet to the terminal. That was really funny. Like something out of a comedy movie. 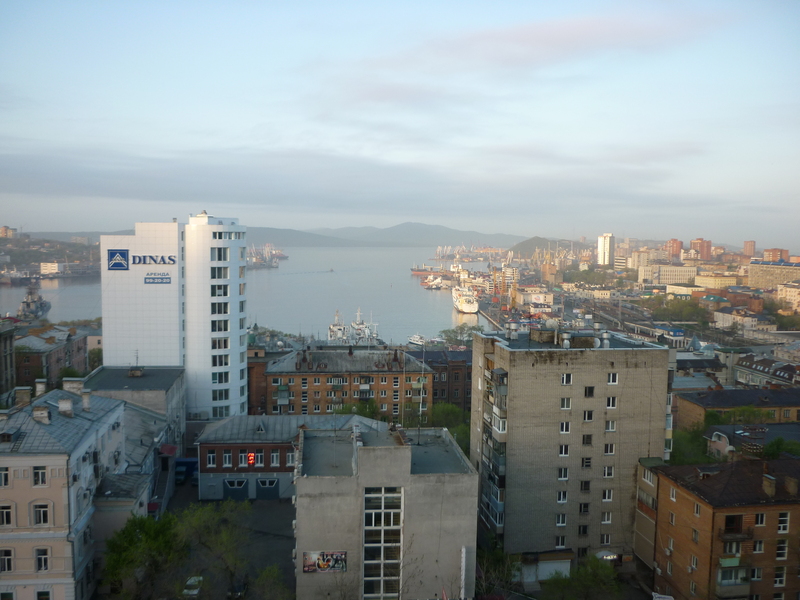 Anyway we arrive by van safely to the Hotel Hyundai in Vladivostok where I checked into a really nice room with a view of the naval port and the Pacific Ocean. When I opened the window in my room I saw a black bag and said to myself “oh man someone left a black bag on the window ledge”. 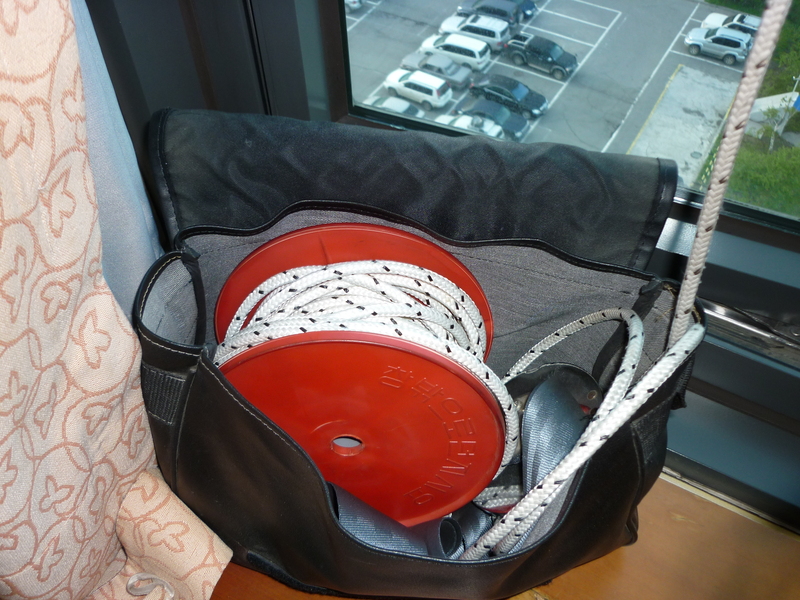 I opened it and found a thick rope wrapped around a large spindle. 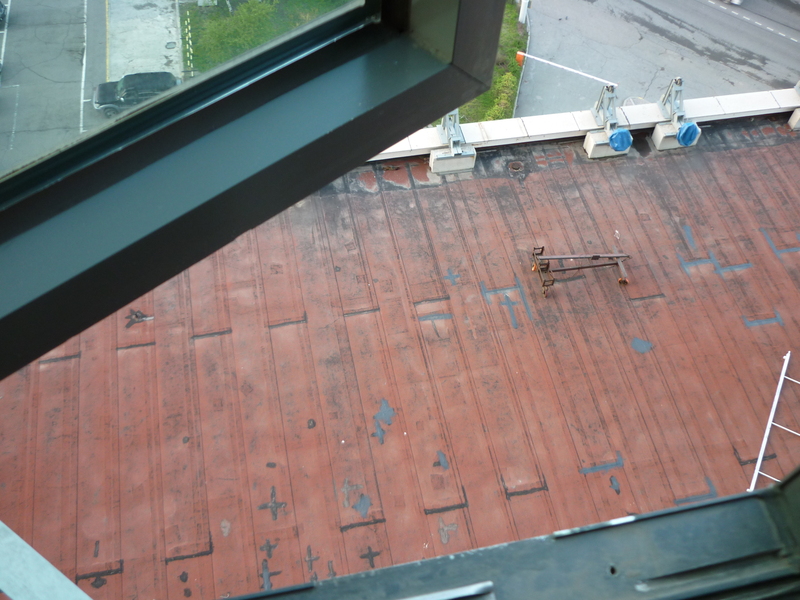 I looked out the window and saw a 100-foot drop and realized that this rope was tied into a giant hook on the ceiling of the window casing. It is the fire escape. If a fire occurs your escape is climbing down this rope 100-200 feet down, which in itself is really dangerous, and you would have to be in great shape and have some rock climbing skills to do it. “DON’T LET GO”!! Totally unbelievable. This would never pass building code in the US. Finally had a good night sleep and we will play music today. More to come!